Caitlin felt certain that someone must have switched two newborn babies at the hospital in Weatherford, Texas twenty years ago, and she was one of them. That was the only logical explanation she could come up with for feeling so out-of-step with the rest of her family. Her parents didn’t mistreat her. In fact, they were basically good, kind people, and included her in all the family activities—though they were few and far between and severely lacking in the fun category. And, even though her younger brother Timmy was annoying, she had to admit that he was an okay kid. They weren’t the problem, she was. Mom, Dad, and Timmy were like three peas in a cozy pod while she dwelled a good distance from that pod feeling like a . . . a jumping bean. No doubt about it. Caitlin was different. Tonight, the family would celebrate Caitlin’s twentieth birthday, only this year the celebration would be different, too. If she stayed strong—didn’t chicken out—and followed through with the plan she’d devised, she’d reinvent her life and begin to live it her way. Of course, this was one of those easier-said-than-done situations. In the past, she’d had little success going against her parents’ old-fashioned traditions and attempting to be her own person. She’d seen her share of old TV reruns and wanted no part of existing in a Leave It to Beaver world. A 1950’s world that suited the rest of her family so well. Hell, that was more than half a century ago. “Are you sure your parents won’t mind that I’m crashing your party?” Lisa asked. Caitlin knew exactly what to expect. Family birthdays were the same every year for everyone. The celebration began when the non-birthday members of the family jumped out from behind the sofa or a chair and shouted, “Happy Birthday” when the birthday person came into the room or through the front door. Nothing too creative about that. They’d all go straight into the kitchen, place a party hat on the birthday person’s head, and enjoy a meat and potatoes dinner. A chocolate cake with candles would follow. This evening, her cake held two candles. One was in the shape of the number two and the other, the number zero. After the age of ten, single candles representing each year were no longer used. That would be frivolous and could start a fire. Vanilla ice cream would be added after the flames were thoroughly extinguished. Yes, indeed. That was exactly what would happen. Right on schedule, mom carried in the cake and began singing the birthday song. Everyone except Caitlin joined in. The birthday girl had an obligation to listen. She gazed at her family and Lisa as they sang, but a group of five-year-olds attempting to play out of tune violins was the vision she saw and the sound she heard. With the cake and ice cream eaten, and the dishes in the sink, it was time for the grand finale: the present. Dad stood up from the table and walked a few feet away. Something was wrong. That never happened before. Why would Dad hesitate to perform his task in the usual Brown family birthday tradition? Knowing that her eyes were rolling, she closed them to avoid any further reprimands. Caitlin glared at her. Mom motioned with her hand for Lisa to sit down, and Dad finally began to speak. Everyone clapped, though Caitlin sensed an odd tension hovering over the table. Did the others feel it, too? Anything that could be called a present had yet to appear. Secretly, selfishly, she hoped that praise wasn’t this year’s present. All bets were off, and Caitlin had no idea what to expect. Dad shook his head. “See that van over there?” He pointed with his thumb. Silence, then, “It’s blue,” whispered Caitlin. Mom cracked a rare smile. “Sure is.” Blue was Caitlin’s favorite color. With this gift came a good news-bad news situation. Dad landed a well-paying job for a change and, for the first time in her life, she had a vehicle of her own. But with Dad leaving, now was not the best time to make her big announcement. No way could she break the news that she was going to leave, get her own place, and do her own thing. Dammit! Her mom’s words did nothing to elevate her discontented mood. How could she survive another year in this house pretending to be someone she was not? It’s not like she wanted to drink beer, kiss men, or throw wild parties. She didn’t. She aspired to be herself, but first, she’d need to figure what that meant. Who was she? What is her thing? So many blanks to fill in. The only thing she knew for sure? Independence! She wanted and needed independence more than anything. Two weeks dragged by. She wasn’t adjusting to her new reality very well. And then the home front situation went from bad to worse. Bossy Aunt Bessie needed a place to stay, and Mom invited her to move in. She arrived the next day and made herself comfortable in Caitlin’s room. No! Survival, not to mention happiness, was not possible with Aunt Bessie as her roommate. The two young women had a few days together before Lisa left on a trip with her boyfriend. They discussed high school memories; it was just like old times. Caitlin, feeling so optimistic, was able to overlook how messy and cluttered Lisa’s little house was. She’d correct that situation in a few days when she had the house all to herself. Caitlin found it difficult to concentrate sitting in the cluttered room. Her mind wandered back to the first day she’d announced at dinner that she felt as if she were a character in a Peanuts cartoon. 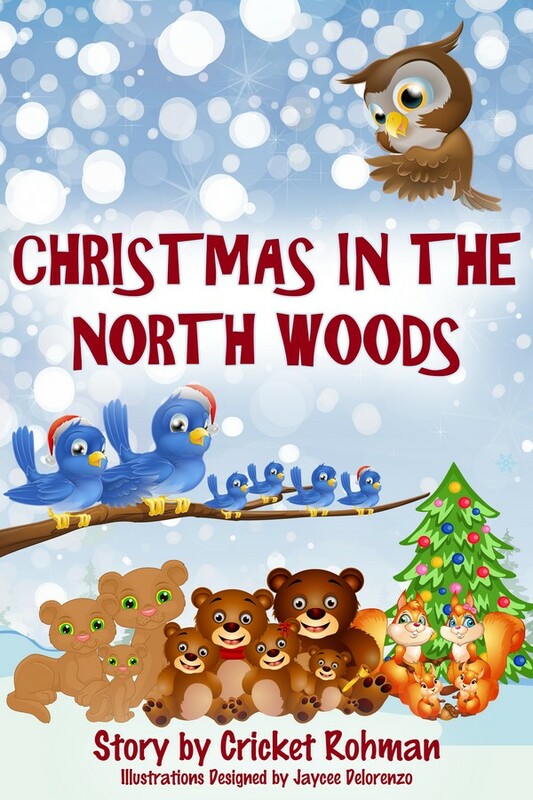 Her mom said, “That’s nice, dear.” But it wasn’t nice because, in her head, she was Snoopy disgusted with the rest of her family who all looked like Pig Pen with dust and dirt hovering over and around them. Nothing nice about that. For as long as Caitlin could remember, she’d been a compulsive neat freak. One more reason to doubt her genetics. But the light went on, and an idea came into view. A cleaning business, of course. One of her college courses encouraged small business ownership. Independence and a business! Caitlin was a Happy Camper except that she had no start-up money. Every business needed that. The day after Lisa departed, Caitlin tidied up her bedroom and scrubbed the bathroom. The rest would have to wait. She had plans to make and work to do. First, she’d purchase one of those magnetic signs, a plain one. Then, with a bright blue permanent marker, she’d write the words, GOT DIRT? I’VE GOT BUBBLES. Proud of her irresistible slogan, she hurried off to buy some cleaning products and the sign. She’d be open for business by sunrise. Day one came to an end, and though she had the cleaning products and a sign on the van, she had no customers. Not one. She’d need to invent a way to promote her business if the locals were to know she existed. How would they connect her to the cleaning service? She’d have to be standing by the van. A phone number would help. Lisa’s home phone had a built-in answering machine. With the permanent marker, she added that phone number to the bottom of the sign. She’d named day two Visibility Day and drove up and down the streets of Clifton Junction parking now and then. Caitlin, the van, and the terrific sign went unnoticed. What else could she do? Parked in front of the hardware store, she saw a bullhorn among the items displayed in the front window. A bullhorn? She could shout her message to the world just like in the old movie, Ferris Bueller’s Day Off. Or was that some other movie? Didn’t matter. It got attention. She’d give that a try. Business couldn’t get any worse than it was. Halfway through day three, she gave up on the bullhorn—it made her feel dorky, goofy, geeky—and decided to drive around the outer edges of the small town, areas she hadn’t been to before. The houses were few and far between, so she gave up on that idea and headed home. She’d driven only a short distance when the van chugged, jerked, and rolled to a complete stop. Turning the ignition produced only a mere clicking sound. The gas gage was on empty, and she wondered if it was truly out of gas, or if the gage showed empty because the engine had died. She didn’t know. She was new to driving let alone taking care of a vehicle. Achieving good grades in school wasn’t doing a damn bit of good out here in the real world. Stepping from the stalled vehicle, she slammed the door, then leaned up against it. Could this day get any worse? A dead to the world van, no cell phone—Mom and Dad disapproved of the new-fangled technology—she couldn’t even make a call. Looking up and down the gravel road and at the few houses there, doubts about her decision to be independent crept in. Maybe she wasn’t ready to be on her own and to start a business with no capital. After taking a business and marketing course last year, she should have known better. Going home was not an option, though. Mean old Aunt Bessie would likely stay with Mom until Dad had fulfilled his contract almost a year from now. Caitlin would rather live in her van . . . down by the river. She laughed. At least she still had her wacky sense of humor. The comical vision vanished as quickly as it appeared. Reality returned to mess with her day, her life. Looking up, she saw a guy wearing a cowboy hat, sitting on a horse and chewing on a long piece of green grass or some kind of hay. She wondered how long he’d been there. He was kind of hard to miss. How did it sound? She wasn’t sure. 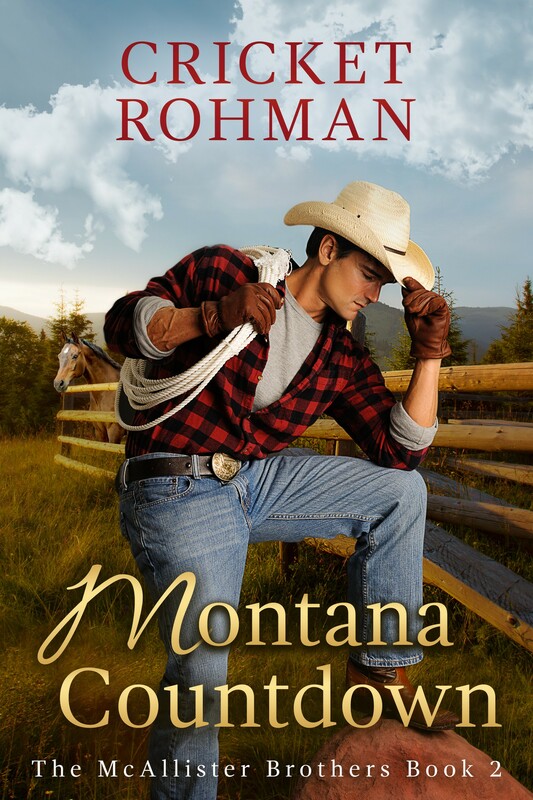 The thought of going home with this good-looking cowboy—oh, yeah, he was without a doubt a ruggedly handsome man, one that Lisa would describe as HOT—set red flags to waving right in front of her face. Hesitation and a whole lot of indecision held her captive. But why would she turn away her first customer? He was a total stranger, that’s why. She could be asking for trouble, even danger or worse. Oh, hell. Did I really expect my customers to be sweet little old ladies? Did he really say ‘hop on’? Only a stuntman could hop on a horse. The guy removed his foot from the left stirrup and reached down to offer his hand. 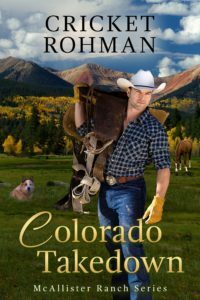 Though not a pretty sight, Caitlin managed to slip her foot into the vacant stirrup and, with the man’s help, pull herself up onto the horse’s back. They arrived at their destination in less than ten minutes. A new problem to deal with—Caitlin had competition. In this small town, any folks in need of domestic help likely already had it. Caitlin was almost finished cleaning up the kitchen when she heard voices in the living room. It sounded like Cooper comforting a woman who was sobbing and saying something about being very sorry. A moment later, they both stood in the doorway of the kitchen each wearing an odd expression. “What? What’s the matter?” asked Caitlin, her voice full of concern. The women shook hands. It was awkward for Caitlin. Cooper’s housekeeper seemed sweet but looked troubled. Did this woman think she was trying to steal one of her clients? Was she? Mrs. Martin gave Caitlin a hug. “Take good care of Cooper while I’m gone. He’s my favorite client.” Then, she turned and asked if he’d recommend her services to everyone he knew in Clifton Junction because she required additional income to help pay for the boy’s operation. Not wanting Cooper to see that her sad expression had come back for a curtain call, Caitlin turned toward the sink to finish drying the drinking glasses. She had competition: A sweet, loved by all, hardworking grandma with a sick grandchild. She could not, would not compete with her. A new plan was called for. The desire for independence was overridden by the need for income. In less than four weeks, Lisa and her boyfriend would be back from their travels, and she’d have to move out. He took out a bill from his wallet, folded it up as if he intended to perform a magic trick with it, placed it on her open palm, and then curled her fingers around it. She held up her closed hand. “Ah, a fist full of dollars,” she teased, before stuffing the bill into one of the back pockets. “My equine taxi service is always available, and so is my truck. You’ll need to be back over here day after tomorrow. Let’s go get your van running. You can hop in my truck this time.” He opened the truck’s door for her, and she liked that. He’d called her darlin’, and she wondered if that was merely an endearment he used with all women. Probably. Caitlin worked at Cooper’s place on three more occasions. Being the original neat freak, she took immense pleasure in making things sparkle and shine and often sang while she worked. She loved receiving the cash and enjoyed the occasional conversations she had with Cooper. But today was her last day working for the cowboy and with no other cleaning jobs on the horizon—she’d been diligently looking for new clients not already using grandma—twinges of panic attacked her rubber-gloved hands, then spread quickly through her entire body. Anxiety! She shook her hands, blew forceful, short breaths from her open mouth, and jogged in place. If only she could run away and hide. Not many hiding places in this small town, though. She needed a steady income and she needed it now, or she’d end up back home in her parents’ dusty, cluttered house sharing her room with Aunt Bessie. Desperately seeking a glimmer of hope or a positive thought—even a tiny one would do—such a thought finally came to mind. She was grateful that Cooper wasn’t around today to see her in such an unbecoming, pitiful state. She’d finished today’s duties and could think of no legitimate reason to stick around any longer. She’d miss his house, the work she’d done here. Hell. She’d miss him. He’d been so kind and generous always giving her more than her hourly fee. 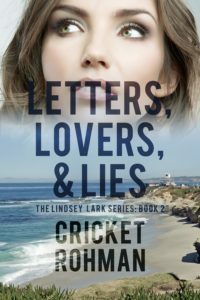 Taking one final look around, making sure every piece of living room furniture shined and every countertop sparkled, she spotted the envelope he’d left on the kitchen table for her. It contained a note instead of cash. It said, Sorry. No time to get to the ATM. I’ll make it up to you next week. Next week! Didn’t he know how much she needed that money? Probably not. He seemed reasonably well off and likely couldn’t imagine how people of lesser means struggled to survive. Of course, he’d make it up to her, but waiting until next week for the cash meant she needed a new plan . . . by the end of the day! Caitlin had to come to grips with the fact that a home cleaning service wasn’t going to fly in this town, not with Superwoman AKA grandma still working. But what else could she do? What else did she want to do? She enjoyed making things look clean, shiny, beautiful, but unless she was willing to move back home—nope, can’t do that—she’d need to lower her self-imposed expectations and take any old job for now. She parked the van on Main Street, walked the entire length of it while maintaining a very happy, though a little fake, smiling face, and stopped in every shop asking if they were hiring. No one was. On the road again, heading west to uncharted territory, she’d check it out. If she landed a job in Mineral Wells, a decent job, she might move there, get her own place. Fate will be her friend and lead her to something good, maybe great. She laughed when the song On The Road Again began to play on the van’s radio. 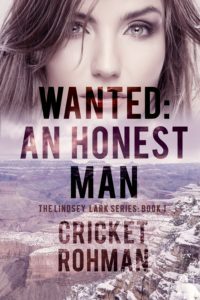 She got out, circled the van, kicked a tire—she’d seen that in a movie as well as at the City Center Mall—and mentally prepared herself as best she could for the walk back to Lisa’s place, which she estimated to be around three miles from where the van broke down. Caitlin steered while Sam pushed. “Why?” She couldn’t imagine owning a business and just walking away from it. Without the slightest hesitation, she replied, “I can live with that if you can help me get the van running or have some form of transportation I can borrow until it gets fixed. What have you got to lose?” Caitlin was on a roll. A wheeling, dealing, energizing roll. Giddy with excitement, she raised her arm, her palm expecting to meet his. She got the grand tour of Sam’s car wash. It consisted of two washing bays, a disgusting little bathroom, and a dingy office smaller than a prison cell. The tour didn’t take long. He drove her to Lisa’s apartment, gave her a set of keys to the car wash, and announced that he and his wife would drop off one of their old compact cars in about an hour. “It’s a clunker, but it runs.” He gave her three months to turn around his nearly dead business. After that, he’d put it up for sale. Caitlin was happy, happier than she could ever remember. She’d be running a business albeit someone else’s business, and Sam had given her free reign to do whatever she wanted. Time was a definite challenge. This new project must turn a profit before the three months were up. Her own survival during this start-up period was equally daunting. First thing tomorrow, she’d take all of her cleaning products and paraphernalia, including heavy rubber gloves and a mask, to the car wash where major degreasing would commence. TAKE TWO . . . Without the funds to purchase or even rent a floor polisher she had to her lower her expectations for sparkle a bit . . . No, a lot. “That seems kind of unusual, but I like the fact that you’re sticking to a theme,” she said. The fact that Cooper looked so damn good this afternoon was a thought she kept to herself. Caitlin was hungry. Starving, in fact. But she’d planned on working until the sun had set, and transforming herself into a date-worthy gal would take some time. An image of a soot-covered Cinderella came to mind. “See you then.” He tipped his hat and rode off. After the server left, she explained to Cooper that she’d just turned twenty a few weeks ago, and didn’t want to break any underage drinking laws. She omitted the part about never, ever having tasted any kind of alcoholic drink in her entire life. Not even a sip of beer. The only alcohol allowed in her parent’s house was a bottle of burgundy that mom sometimes added to stew or spaghetti sauce. To the best of her knowledge, no one ever drank it. Cooper had a faraway look in eyes at the end of her story. A look she couldn’t define, but it felt sweet, caring. Perhaps her story had brought back one of his childhood memories. Their food arrived, and eating took the place of talking for a while. Caitlin was the first to break the silence. “No need to feel that way. I only know yours because Sam told me.” He held out his hand, and said, “Pleased to meet you, Caitlin Brown. My name is Cooper Clifton Anderson.” They shook hands and laughed. He drove her back to Lisa’s place and walked her to the front door. “Thanks for having dinner with me.” He bent down and kissed her on the cheek, then turned and walked back to his truck before she was able to respond. She waved as he drove away. Once inside, she forced herself to breathe slowly—panting was so unbecoming even if no one was looking. Cooper Clifton Anderson was just being friendly. Nothing more. Focus. Focus! Concentrate on creating independence, not on a handsome man. As before, Cooper paid more than what she charged. She put $50 into her pocket and opened a bank account with the remaining $150. When the banker offered her a credit card, she took it! She bought some paint, sponges, air fresheners, and metal polish for the coin machines using her cash. Any additional purchases would be charged to her credit card. And charge she did. She splurged on a neon OPEN sign, several potted plants for the entrance and the office, as well as two colorful pots of flowers she’d set by each washing bay. Once everything was in place, she stood back to admire her work. Already, the transformation was impressive. She’d implement additional improvements when the money began to roll in. After a few more days of cleaning, she plugged in and turned on the OPEN sign. Only two customers stopped by. Sam in his Chevy sedan and Cooper in his truck. They told her the place looked good and wished her luck. As much as she appreciated their kindness, it did little to make up for her feelings of failure. She’s gone into debt, and the one or two paying customers that stopped in each day did little more than keep her from starving. At the end of her first full week in business, she made some calculations. As she’d suspected, her findings were bleak. The expenses far exceeded the income. That had to stop. Cooper had his truck washed twice that week. He’d paid the full-service rate, which included Caitlin’s special touches: An interior fragrance—musk, fresh lumber, or pine; hand-polished exterior chrome; and chamois-dried windows. Note to self: Purchase a step stool. He left a substantial tip in the tip jar. That had to stop, too. She needed real customers, not his pity. She did, however, accept another dinner invitation, and welcomed the break from non-stop work and worry. She didn’t know where that comment would lead. It made no sense, and she chose to ignore it. They ate in silence for a while. She didn’t want dessert, she wanted to go home. He responded, not with words, but by unbuttoning his shirt, and grinning. Speechless, she stared at his chest and abdomen. She’d heard about six-packs but had never seen one except in the spirits section at the grocery store. Oh, yeah. Women would pay to watch him wash their cars. “Better than I could have imagined, our relationship is moving ahead at lightning speed. He just might be the one. I wanted to see how you were getting along because I might not be back for a while. Manager of a car wash? That is fantastic. I’m so happy for you. Right up your alley, too, huh? “Yes, I suppose it is.” She didn’t feel up to providing her friend with all the dreary details and chose not to rain on Lisa’s perfect parade. At least one of them was happy. No doubt about the smile in Lisa’s voice. She had to admit, the shorts, the top, attracted attention. More cars and trucks pulled into Caitlin’s Car Wash than ever before, which someday might convert to income. This week the drivers of those vehicles, mostly young cowboys, just hung out. They didn’t come by to get their trucks washed; they came by to get a good look, hoping for a date—with her. At first, unaccustomed to so much attention, she felt flattered and caught herself acting flirty. Of course, her sensible side soon took over, but a little voice in her head kept repeating that a girl’s got to do what a girl’s got to do for the purpose of making a sale. When no one paid for a car wash, not even the cheap basic wash, she wondered if that was due to her poor sales technique or unskilled flirting. She went inside the office, took out a coke from her small Igloo cooler, then sat and sipped. Only three weeks into her car wash business adventure second thoughts attempted to creep in and take her down. The fact that she had nine more weeks to make a go of this project should have bolstered her moral, but it didn’t. How could she survive nine weeks without any money? Yes, the car wash facility was greatly improved. She’d seen to that. But a cleanliness make-over and her short shorts hadn’t increased business at all. This car wash needed pizzazz, something more to draw folks in. The idea struck her like a lightning bolt. Food! A snack bar. Yes! That would do it. Everybody likes to eat. Soon, she’d have two avenues of income. She high-fived the wall, ran outside and performed a brief happy dance of her own invention. The real Caitlin was back. Positive energy gushed through her veins. She’d work on the new plan tonight. She’d purchase candy bars, bags of chips, soda, and microwavable foods. She added a microwave, a small freezer, plates, and plastic utensils to her shopping list. The next morning she visited the hardware store and the grocery market to price the items she’d need. Wow! No way. She had less than $45 but didn’t want to go further into debt. If it weren’t for Cooper, she’d be penniless. Think. Think. She had nothing of value to sell. No jewelry, no furniture, no . . . Wait. The van. She could sell the van to finance the business, but how would her parents feel about that? They had given it to her as a gift. A rare, generous gift. Surely they’d feel sad, betrayed, and hurt. Could she live with that? Possibly, they’d be proud of her ingenuity, determination, and business sense. After all, mom had insisted she obtain an associates degree from the community college. She was merely putting her new knowledge to work. I like the sound of that. She still had the use of Sam’s old car, so her transportation was covered for a while, and Lisa had extended her vacation, so she had a place to live. She could do this. She could survive until business picked up. First, Caitlin drove to the car wash to place a quickly drawn Come Back Tomorrow sign in the window. Next stop, Sam’s house to share her brilliant idea. “Well, that’s one heck of an optimistic plan. Kind of risky, though. You’re puttin’ all your eggs in one basket.” After another round of Caitlin’s rhetoric, he agreed, though reluctantly, to pick up the pace of fixing the ailing van and take charge of selling it for her. “How much are you asking for it?” Sam asked. Swaddled in confidence, but lacking in patience, she went shopping . . . with her credit card. She was about to ask him what rasps and nippers were, but Sam came running in, out of breath. Being naïve about financial matters, Caitlin jumped for joy as he handed her the cash. That was a fortune to a twenty-year-old whose only income so far had been the $10 a week allowance her parents gave her for helping with chores around the house. Cooper drove the microwave and the freezer over to the car wash. She followed behind in the Honda with the rest of her purchased items. They had a blast rearranging the office area making room for the new snack bar component of the business. “You got it.” Gazing intently into her eyes, his tanned face smiling, he added, “You’re one hard-working young lady. I admire that.” He stroked her cheek with the back of his fingers, tipped his hat, and returned to his truck. She watched the truck as it pulled out kicking up a good deal of dust and gravel, and took note of Cooper’s macho departure. The time passed so quickly as she tended to the latest phase of her car washing business that the blackness of the sky came as a complete surprise. An unwanted surprise. Not that she was afraid of the dark, she wasn’t, but she’d rarely had an occasion to be alone at night. Her mom was almost always home in the evening, and friendly neighbors lived in all directions. No neighbors here, no moonlight, not even a light from a distant window was visible. It never occurred to her, until tonight, that the darkness itself could hide all sorts of dangers. With a flashlight in hand, she locked up and dashed to her temporary transportation all the while looking forward to filling the clawfoot tub at Lisa’s cute little house with steaming hot water. Her sore muscles and tired body needed a relaxing soak. Though the drive was quick, less than ten minutes, she managed to map out the rest of her evening. First, she’d put in a load of laundry that included her work clothes AKA short shorts. Then, she’d dust the furniture and wipe countertops before getting into the tub. Ah, the anticipation of submerging down into soothing hot water brought a smile to her face. The thought of pouring in some of Lisa’s bubble bath produced a giggle. She slipped the key into the lock. “What the hell?” she shouted, though no one was around to hear her. She jiggled, twisted, and retried the house key several times. It didn’t work. How was that possible? It had been working fine ever since she’d arrived in Clifton Junction. She went around back hoping she’d forgotten to lock that door. No luck. She tried opening windows. Again, no luck. There must be some mistake. She was hanging by a thread without any real income but temporarily surviving. But with no place to live? Her breath quickened, dizziness set in. Don’t panic. Do. Not. Panic! Her thoughts had little effect on her feelings. The tiny town had rolled up its sidewalk a few hours ago. What were her options now? She was not about to go home admitting defeat. Cooper would likely take her in for a night or two, he was a nice guy, but she wasn’t ready for that and didn’t want him to see her as a desperate failure. She walked back to Sam’s old car chanting, I won’t give up. I can’t give up. And then drove to the car wash. Tomorrow, she’d find a phone and call Lisa—at least her friend had a cell phone—and ask what’s going on with the house. In the meantime, she’d get some rest. She parked the car in one of the two washing stalls, locked its doors, and curled up in the back seat. Fortunately, it was a warm Texas night so she would not be cold. Being comfortable was another matter. Feeling safe? Now, who was she trying to kid? Sleep finally came, but so did a summer storm. The rain plunking on the tin roof like thousands of ants marching back and forth wearing tiny little combat boots nudged her from a state of deep sleep. A loud crack of thunder woke her completely, and she sat up abruptly wiping the nervous sweat from her brow. Weather. It’s just weather, she told herself. With the rain came mixed feelings. No one would want his or her car washed or food from the snack bar during a storm. But the storm would produce puddles, mud puddles. After the sun came out and things dried up a little, surely everyone would want to wash that caked-on mud off of their cars and trucks. And she’d better be ready. Caitlin moved the car from the stall and dashed into the office. Before long, the rain stopped, and rays of sunlight poked out from the remaining dark clouds. The air, heavy with humidity, was also fresh and dust-free. Something amazing will happen today. She was certain of that. A scratching sound took her thoughts in a different direction. Scratching? What was that? She heard it again. It was coming from the other side of the office door. She saw nothing from where she stood, so she moved closer. The scratcher had added howling to its repertoire. What the heck? “Oh, my,” she said, reaching down to lift up the very wet puppy covered in mud. “You’re far too muddy to come in.” But it was too tiny to be left outside by itself. Wait! She was in the business of cleaning. That was her expertise. A muddy puppy? I can fix that. She set the soggy pup down while she dragged a table from the office into the middle of the closest stall and gathered some sponges, a bucket of warm water, and few towels. 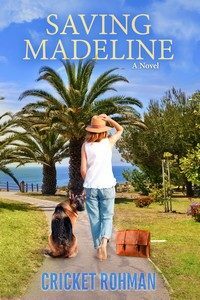 By the time she was ready to wash the puppy, it was dirtier than before, having rolled in a mud puddle or two or three. She placed her hands around its tiny tummy and picked it up firmly, due to its tendency to wiggle a lot, holding it away from her clothing. Clothing she’d worn for the past two days and nights also in need of a good washing. The pup had no collar or leash and keeping him on top of the table with one hand and doing all the washing with the other proved to be trickier than expected. “Okay, let’s see what you really look like.” She spoke softly and poured cups of warm water on his mud-coated fur. Constantly turning in circles, he tried to bite each stream of water, which made Caitlin laugh out loud. Next, she rubbed some soap into its fur. Just a few small drops because it was soap for cars, not puppies. It must have liked the rubbing motion because the little dog relaxed, calmed down. They both looked up when a Buick sedan zoomed by, then skidded to a halt, turned around, drove back, and pulled in. Weird. Then she realized that it must be the puppy’s owner. That made sense. A woman stepped from the car and waved, “Can you—” Her words were interrupted when a large dog jumped out from the same car nearly knocking her over. The short-haired, long-legged dog leaped around her, then shook its whole body as only wet dogs can do. Mud splattered in all directions, much of it landing on the woman’s clothing, some on her well-coiffed hair and pleasantly made-up face. All of which, induced a screeching sound from the woman’s mouth. Rufus was too large for the table, so he stood in the center of the car wash stall while she rinsed him, soaped him, then rinsed him again. The woman, Winnie Parker, chatted non-stop. It seemed her dog had gotten away from her this morning and found the perfect puddle to wallow in. She’d been on her way to Weatherford to a dog-grooming shop she often frequented when she saw Caitlin washing a dog, right here, mere minutes from her home. What could she say? What did she want to say? “No, but I had to sell the van,” were the only words she came up with. Winnie kept on talking while Caitlin dried Rufus and thought about a whole new way to run this business. Slightly dazed by all that had transpired over the past twelve hours, she nodded. “It was good to meet you, Winnie. See you later, Rufus.” The woman, except for her made-up face, reminded her of her mother. The woman waved, the dog wagged, and Caitlin went in to check on the puppy and thinking how much she enjoyed cleaning up the two dogs. She picked him up, so they were eye-to-eye. “Hey, there. You look good now that you’re clean and dry and fluffy. But what am I going to do with you? I never had a dog before, just some guppies and a hamster. You’re so adorable, but I think that we shouldn’t become too attached because your owner will show up eventually, and take you away. What do you think?” The tiny canine snuggled against her neck before giving her a damp dog kiss on her cheek. Had she been a woman of leisure, she’d have played with that pup all day long, but she had calls to make and animal-washing equipment to buy. Whatever that might be. Thank goodness for credit cards. She placed the pup in a cardboard box, set it on the back seat, and told him to stay. His little head poked up just enough to be seen over the edges of the box. “Our first stop is Cooper’s place.” If he were at home, that would be the best place to make her calls. If he wasn’t there . . . she’d figure that out later. They were almost there when she heard the pup whimper and the box tip over. Within seconds, the little guy scrambled up onto the passenger seat and smiled. Yes, it smiled, just before curling up in a ball and falling asleep. Just a few more turns and they’d arrive at Cooper’s house, so she let that tiny sleeping dog lie, then giggled about the phrase that had popped into her head without any encouragement. Glancing to her right to take a quick peek at her new furry friend, she discovered he was no longer there. 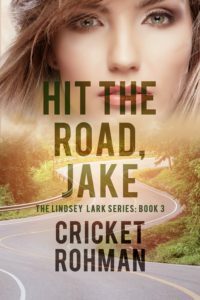 There was no safe spot to pull over and stop, so keeping one hand on the wheel and her eyes on the road, she felt around as far as her arm could reach. Something pounced on her left foot. The puppy was on the floor by her feet. She needed to step on the brake pedal, but couldn’t do that without squashing the pup, and she couldn’t get him to move using her feet. In the few seconds it took for her to bend down and grab the pup, she felt a jolt and heard the sound of metal crunching. Either, she’d run into something, or something had bumped into her. Stunned, she just sat there holding the pup. Caitlin hoped her eyes didn’t look as unnaturally, wide-open as they felt. She enjoyed the way he looked at her, spoke to her, and took her out to dinner occasionally, but she’d never let herself expect more. They were good friends. I’d do anything for my friend, Lisa, and now he’d do anything for me, she thought, because we are friends. Maybe that was all his statement meant. Lisa’s cell phone rang and rang. No answer, but she was able to leave a message. “Hey, Lisa. Where are you? When are you coming home? The key to your house doesn’t work anymore. Someone must have changed the locks. I have nowhere to stay and I can’t even get my things. Please call ASAP.” She put her hand over the receiver and asked Cooper if she could leave his number for Lisa to call back. He nodded, then grinned, and Caitlin wondered what was so darn amusing about giving Lisa his phone number. “Well?” She stared at Cooper as he stood there with a mischievous look on his face and holding the pup. Suddenly, she felt as if she had a puzzle to solve, but too many pieces were missing. What was he not telling her? Doubts about her recent choices crept in, and her determination to be independent of her parents withered like a forgotten houseplant. “It’s a small town. I know almost everyone here, and everyone knows me.” He took the cordless phone from her hand, kissed her gently on the mouth, and began to make a call of his own. Shocked by the unexpected kiss, Caitlin, more confused than ever, sat on the floor with the puppy on her lap listening to Cooper’s half of the phone conversation, though it didn’t make much sense. It seemed he wasn’t kidding about knowing everyone or being in a hurry. He was out the door before she could come up with anything intelligent to say. Now, many questions overwhelmed and nearly paralyzed her ability to think and move forward with her new vision for the car wash.
THIRD TIME’S A CHARM . . .
Knowing that she’d have a real bed to sleep in tonight, and relieved to see that Sam’s car had only one small dent on the left side of the front bumper, she got in and drove away to begin her spending spree. Yes, once again, she’d be placing all of her eggs in one flimsy basket. She shopped at lightning speed and soon had everything she needed to clean and dry a variety of animals safely and sufficiently. Now, she was the one in a hurry. At the top of her list was the puppy. She’d swing by and pick him up from Cooper’s kitchen and then try to get to the car wash before the delivery truck arrived. The little dog was gone. So were the bowls, the newspapers, and barrier she’d set up to contain the pup. Apparently, Cooper wasn’t happy with what she’d done and had removed the pup from his home. Well, she wasn’t too happy with him either. Men! He lifted the large, heavy items from the pick-up truck first: several metal tables, one adjustable grooming table, and a four-foot by four-foot blank sign. Caitlin grabbed all of the smaller items: Three quarts of paint, two paint brushes, shampoo suitable for animals, soft-bristled scrub brushes, towels, buckets, a hair dryer, an extension cord, and a heat lamp—usually used to keep newly hatched chicks warm, though she would use it to dry the wet fur of those with an aversion to the blow dryer. Everything was in place, and her excitement was on the rise. Only one crucial task left to do: paint the new sign. She’d thought long and hard about the words that would tell the world about this new business. The sign, its words, had to be perfect. She created another small sign that she’d prop up closer to the road and it would say Grand Opening. The sign-painting process took almost two hours, and Caitlin was delighted with the finished products. They would not go unnoticed. She had no way to hang the sign, not yet. For now, she’d drag it out in the front of the small office-snack bar section of the car wash structure, where it would be sufficiently visible from the road. So engrossed in that final task, she paid little attention to her surroundings, which was why she cried out when she backed right into . . . Cooper. And he wasn’t alone. “How can that be? He’s only known me a little over a day, and he was with you during most of his wide-awake hours.” She loved the feel of the pup’s furry little body as she held him in her arms, and the way the pup looked at her with his bright, happy eyes brought certainty to her thoughts about the origin of the term warm fuzzies. “Easy for you to say. It’s not your Grand Opening.” Suddenly, struck at the seriousness of her situation, a case of nerves combined with a fear of failure paralyzed her. The small diner’s dinner special was home cooked meatloaf, garlic mashed potatoes, and fresh green beans, which was highly recommended by Rodney, the cook, who’d come out to say hello to Cooper and to meet Caitlin, the new manager of Sam’s Car Wash. The three adults had a brief conversation about how they’d acquired their canines. It seems that in both cases, the dogs had found them. Caitlin wondered if the dogs’ owners were broken-hearted by the loss, or worried about the safety of their missing pets. Or perhaps they didn’t care. Caitlin and Cooper’s eyes met, and, between bites, they spoke of putting up a few Lost Dog signs around town. “Do you want to do that?” Cooper asked. “Perfect. Give me five minutes. I’ll just clean up the kitchen, then we can make the signs. Prioritize, she told herself. The spoiling milk bothered her the most so she hurried toward the table to confiscate the milk carton. That was her intention. What happened was something entirely different. Did she slip on an unseen liquid substance on the floor or trip over an object? Either way, she lost her footing, and all she remembered was trying not to land on Little Buck. Caitlin moaned, the puppy barked, and Cooper came running in from the living room to check on the commotion. He helped her up only to discover she was unable to put any weight on her left foot, and swelling had begun. X-rays had been taken, and now they waited for the results. The garish, bright lights in the examination room accented her already disheveled, in need of a shower appearance. She didn’t need a mirror to know that. “Looks like you’ve got a small fracture going on there. You’ll need to keep off your foot for several weeks if you want that ankle to heal up properly.” The doctor’s news was bad. If she were back home in Weatherford, her mom would let her lay around the house until she felt better. She’d bring her things to eat, movies to watch. There’d be no worries about earning an income. But instead, she was here in Clifton Junction being independent. They drove back to Cooper’s place in silence. Caitlin had a small container of pain pills in her hand, and she wore a cumbersome, temporary cast that covered part of her foot and ankle. On the bright side, it was navy blue. 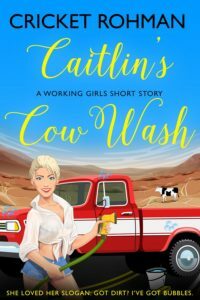 All she could think about was the Grand Opening of her car wash—Caitlin was a one-woman show—and now that show was going to be a total disaster. She gasped in amazement when her sign came into view. There it was, CAITLIN’S COW WASH, hung above the two car wash stalls for the whole world to see. As Walt pulled up and parked, she noticed a new sign between the two stalls, one she’d thought about making, but hadn’t had the time, yet there it was. On that sign, one arrow pointed to the right and above that arrow were the words Cars & Cows. The other arrow pointed to the left stating, Everything Else. “Thanks, Ralph,” she said, sitting in her assigned seat, ready to reign over the Grand Opening festivities that would begin in less than thirty minutes. Rodney’s arrival was a total surprise. She watched as he set up a food table to complement Caitlin’s treat-filled shelves. Walt volunteered to be the cow and car washer using the traditional car wash equipment. Sam was assigned to the wash everything else position, though Cooper would be his alternate. Last, but not least, Cooper placed Little Buck and Chelsea in the cutest enclosure she’d ever seen—a low, white picket fence. The fence had its own sign: Petting Zoo. It was close enough to Caitlin so she could make sure the dogs were safe and having fun. “I’ll keep that in mind. Something is coming up that you could . . .” A long and loud blast of a car’s horn interrupted his comment, though he didn’t seem to mind. In fact, he seemed pleased. Caitlin recognized that car as it drew closer. It belonged to Winnie Parker, the woman who had, inadvertently, given her the new concept for the car wash. A parade of vehicles followed behind her. Winnie and her passenger hurried from the car carrying toolboxes and shouting, “Sorry we’re late. We’ll get the pay station set up in a jiffy. Got plenty of change right here.” Apparently, the toolboxes had become cash boxes, at least for today. Caitlin jumped up from her chair. “Mom?” She couldn’t believe her eyes. She blinked. Perhaps this whole day, especially the sight of her mother, was a dream. A dream enhanced by pain medication. Yes, that was a possibility. This entire setting was a hallucination, not real, too good to be true. “Hello, Caitlin. I’ve missed you, but I can see you’ve been busy, working hard. Good girl.” The two stood face-to-face, neither made a move hug the other. Nothing surprising about that. Their family rarely showed outward affection. “Well, dear, most folks know Cooper Clifton (wink, wink) Anderson even over in Weatherford, and Winnie and I went to high school together.” She shrugged and hurried over to help her old friend with the cashier duties. Caitlin wondered why her mom winked. She wasn’t the winking type. Country music from a boom box a filled the air as a steady stream of cars kept coming. People devoured Rodney’s food and seemed to enjoy each other’s company and the buzz of activity. Plenty of cars, dogs, cats, wheelbarrows, tools, outdoor furniture—the list goes on—sparkled at the end of the day. Seven cows were hauled over by one of the rancher’s wives. Several customers begged for a turn at washing a cow. Those Herefords left looking mighty fine. By the time the sun dipped below the horizon, Clifton Junction was the cleanest town in Texas. “Just water, thanks.” She waited with the pup on her lap for Cooper to return from the kitchen and begin providing the missing pieces of the Lisa-Cooper-Clifton Junction puzzle. That was a lot to digest. Lisa in love, moving to Colorado, not here paying the rent. That could be a problem. Did the owner expect her to pay the entire amount? She wasn’t there yet. She must have given off stressful, worrying vibes because Cooper gently tipped her chin upward and kissed her passionately on the mouth. She set the pup on the floor and returned his kiss upping the intensity. They’d shared a few friendly kisses before, little pecks on the cheek, and an occasional hug, but there was nothing friendly about tonight’s physical contact. They were two young and healthy adults in need of each other, to be close, intimate. And they were about as intimate as a man and woman could get . . . with their clothes on. Caitlin’s ankle healed well, though caution was still called for. The cast had been replaced with a stretchy but tight support sock, and any time she wished to move quickly, she used the athletic crutches. She’d become so adept in their use she could almost run. When Sam proposed a deal too good to refuse, it opened the doors to a business partnership between Caitlin and Cooper. Yes, he still owned the car wash, but very few knew that he also owned the five acres of land surrounding the small business. He announced that he’d be happy to sell it all far below market value if Cooper and Caitlin were the buyers. He didn’t want it anymore, didn’t need it. In the near future, two businesses would occupy the land with room to expand. Cooper began construction of a tack room, a shed, several horse stalls, a small office, and a round pen. From there he’d operate Cooper’s Equine Hoof Care business with Caitlin’s Cow Wash right next door. Perhaps being independent wasn’t so important after all. Though their love blossomed like a field of Texas bluebells, Cooper and Caitlin took the personal side of the relationship one step at a time, wanting to get it right and make it last. Even with their slow and steady pace, many citizens of Clifton Junction could be heard saying they were the “hottest item” ever to reside in The Cliffs. and being a loyal subscriber to my almost-monthly author letter. This story will be followed by several more and will eventually be published as a collection of short stories in The Working Girls series. Until then, please do not share this story. It’s an exclusive preview for my subscribers. I hope you liked it and I’d love to know if YOU read the story.